The idea for the series Lunar Landscapes came about on an impromptu photo shoot at Dreamy Draw Park for the Super Moon full moon on 12/02/17. 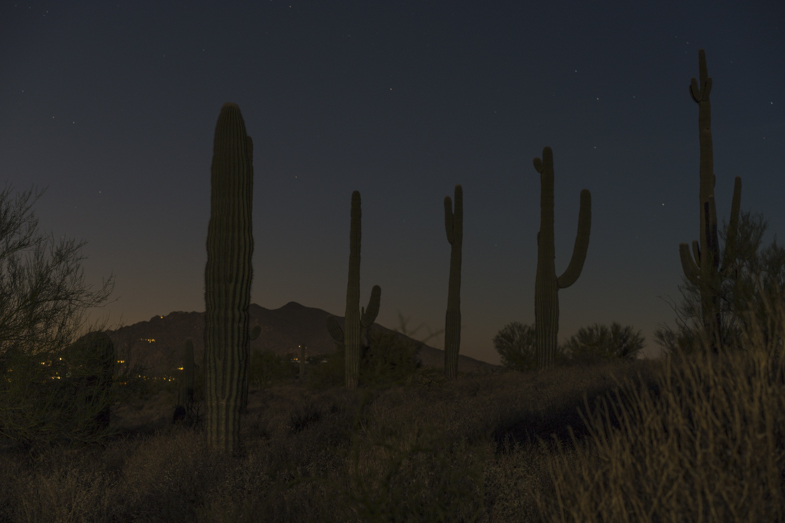 The series came together in my mind while waiting on the moon to crest the mountain – each month for each full moon, a different park, in Arizona. The goal was to photograph the landscape, to catch the full moon cresting the horizon, so I could do what I love to do: be outside at night shooting long exposures. But not just anywhere. Here, in Arizona, in the desert with the rocks and cacti. 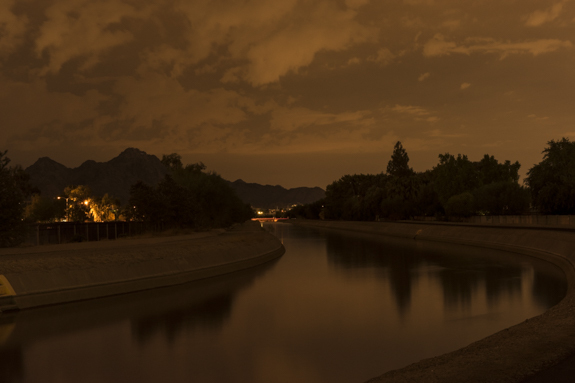 In 2015 I shot HOT SUMMER NIGHTS, all long exposures at night of urban landscapes – all in Phoenix. 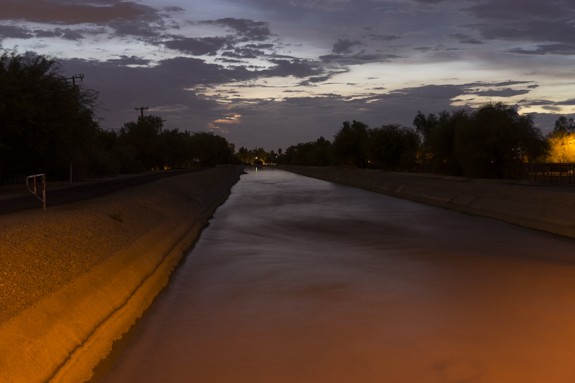 In 2016 was Night Water, again, all long exposures at night, of the canal system here in the city – then in 2017 I only worked on Nightlight – a self-portrait project, shot indoors, again long exposures done at night, but indoors. I missed shooting at night outdoors enormously. I was so ready to get back outside again. I can’t quite put my finger on it, to say it’s beautiful here is an understatement, it’s quite striking. When I’m outside at night I’m not experiencing some kind of metaphysical out of body mind meld magic – maybe I am! ;) What I know for certain is that the combination of the light and the color and the heat feels magical. 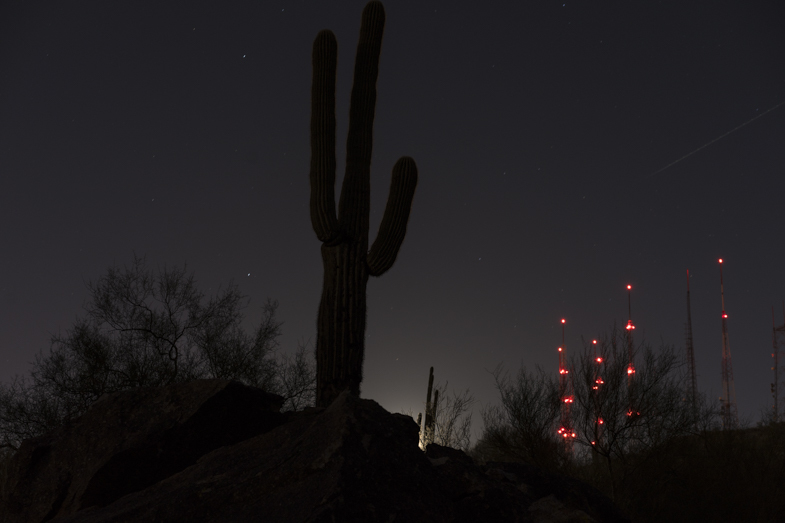 I so wanted to get back to doing what I had done before – long exposures at night, but this time in the desert. Away from the urban core and the artificial lights. 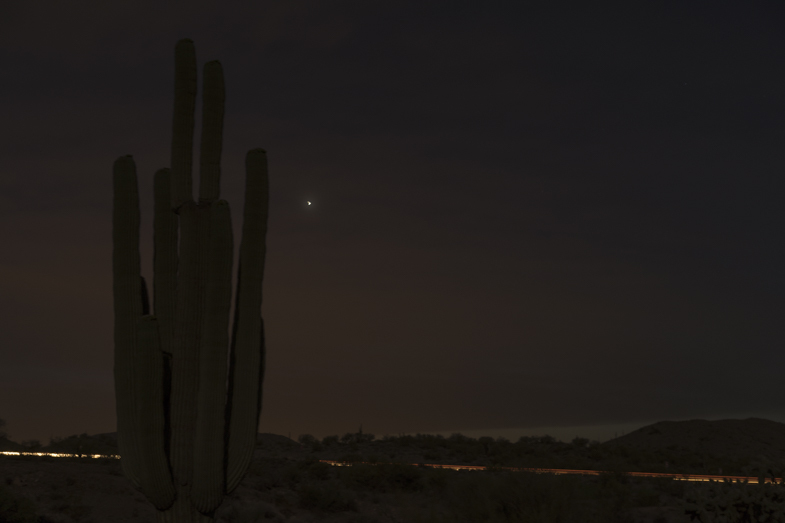 And be among the cacti and the creosote bushes and the sage and the rocks – under the moonlight. Each month I scout out a new location, typically a park, although one month I shot at a private residence. 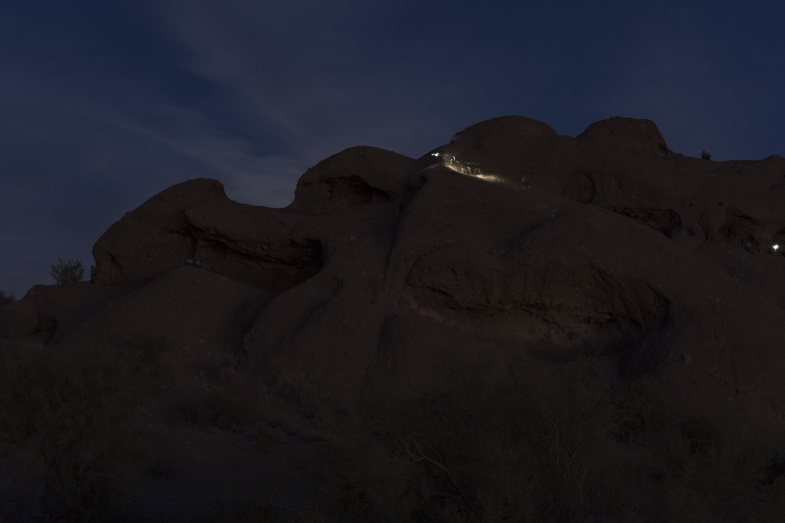 The time frame of the shoot is very narrow – it’s one night, once a month, within in a matter of minutes as the moon is rising. And then it’s over – until the next month. 12 months, 12 outings. Narrowly defined parameters is something I consciously imbue into each of my projects. Setting my own “rules” for each series builds pressure which helps me clearly and purposefully create. Precisely defined boundaries – where ambiguity is absent, is inherent I feel, not only in how I prefer to live, but in my photography itself. Even in the murky darkness of my work, there is little that is not clearly what it makes itself to be. Phoenix is intense and harsh under the daylight sun, yet magical and beautiful at night when color is sultry and saturated – it’s palatable. A time when color reveals itself as tangible. I want to capture this heady mix within the urban landscape. Deliberately devoid of humans, my photography centers on architecture, streetscapes, city vistas – the lesser seen and the unseen within a human built framework. 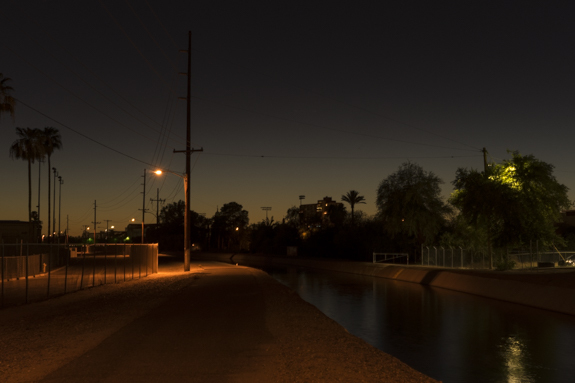 Night Water is my third series exploring Phoenix at night — focused solely on the nine canal systems. Scenes here are from portions of two of the nine. I am motivated by not knowing what I will find — yet knowing I will find something. Something beautiful, intriguing and worthwhile. 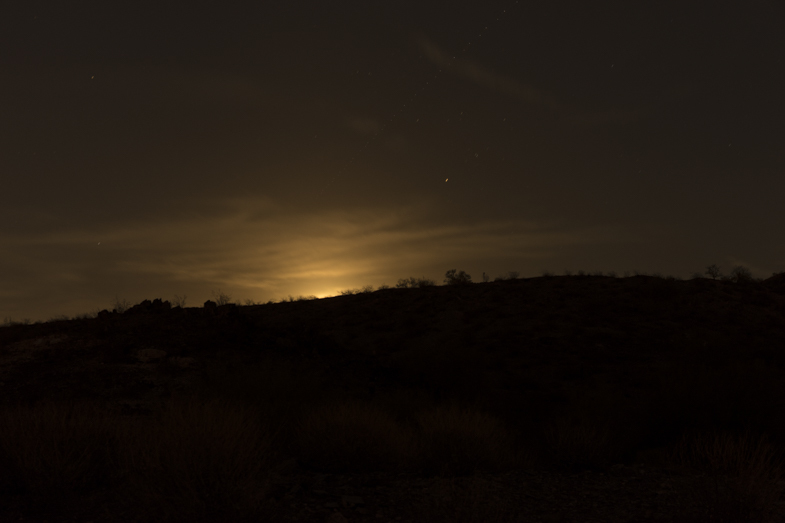 It’s within this process; seeking, seeing, capturing — this is where I am most at home, this is where I want to be — here in the desert, at night.